Human faces tell a story about life. Over the long course of history, that story has not changed much. Debra Mancoff takes a look at the various ways this story has been expressed in arts and cultures over the centuries in The Face: Our Human Story. “Our facial features,” posits Mancoff, “are a window to our hearts and minds.” If we study the faces of history, we should, by extension, understand something of their life stories. We should be able to identify what mattered to them, how they felt about their experiences, and the relationships that were important. Mancoff is interested in this line of inquiry as she strolls through the British Museum. Backing up for just a moment it is helpful to consider the British Museum itself. Founded in 1753, the British Museum in London was the first national public museum in the world. It houses manuscripts, natural specimens, coins, medals, prints, drawings, and ethnographic material. Items range from the King’s Library to the Parthenon sculptures and anything in between having a relation to human history, arts, and culture. One of the top ten most visited museums in the world, more than five million people check in every year. It would not be a stretch to say that the British Museum has the largest collection of faces anywhere on earth. It is these very faces, from the British Museum collections, that Mancoff divvies up between seven stages in the cycle of life. She covers birth and childhood by pointing out babies’ preferences for faces and the child’s mastery of facial manipulations for emotional communication. A pottery figurine from 2000 BCE Cyprus, a French ivory 1320’s statue, a woodcut from 1520’s Germany, a black and white photograph from 1880’s Egypt, and a slide from 1900 Iran, each demonstrates the breadth of Mancoff’s facial findings. A brief introduction kicks off Mancoff’s thoughts behind each chapter: Birth and Childhood; Love and Beauty; Everyday Life; Faith and Ritual; Rulers and Warfare; Identity and Disguise; Death and the Afterlife. Illustrations of artifacts from all four corners of the museum’s worldly collection accompany key points and descriptions, similar to those one might find in the museum if one were perusing the rooms oneself. Which brings up a clever concept. In a way, this book is a brilliant new subgenre. Museums make catalogues on a regular basis for special exhibitions, targeted artists, unique features of important acquisitions, etc. Where this one differs is in its thematic approach. The reader is privy to insider docent exposure about a wide range of artifacts connected to the theme at hand without having to physically traipse from floor to floor. In lieu of conquering a museum by systematically viewing objects as the rooms are laid out on the map, attempting to make sense of the huge amount of items and see as much as possible, this book offers more of an organized treasure hunt centered around a specific topic. This is a different form of armchair travel, with a well-spoken tour guide, and an interesting way to visit a large museum. Indeed, in just about as much time as it would take to get worn out in a museum this size, the reader can digest the entire book and absorb much more information on the topic. Not to reduce the effectiveness of the content, the one tiny, critical downside though, to this particular project, is that the font size is far too small. This is an unfortunate design choice most likely made so as not to have too much text compete with the stunning images. Equally hard to read are the instances when the type is set on top of a hued page. Beautiful as it may be to the overall aesthetics of the book, the practicality of its use is limited. 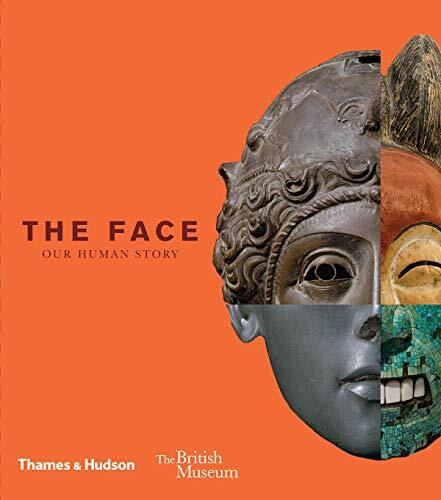 Written by a writer, educator, and art historian, and presented in a compact seven by seven inch size, The Face: Our Human Story is an entirely approachable, relatable and enjoyable exploration through the many expressions that make us human.